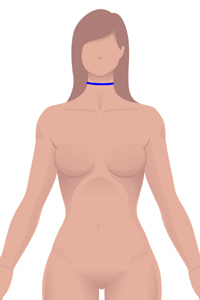 The measurement is taken around the hip bone just beneath the navel. 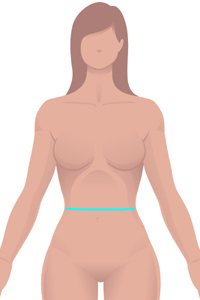 Measure around the center of the hip bone. This is the bottom of the hem of a T-shirt, or the waistband for hiphugger pants, for example. Measure around the widest part of the thigh. This is 2 inches down from the center of the crotch. Measure around the widest part of the knee, 16 inches up from the ankle. 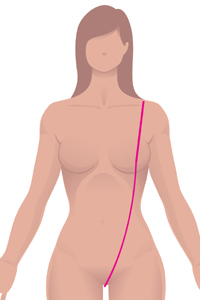 Measure from the center top of the shoulder to the point where you want your sleeves to end. Measure all the way around the bicep (do not flex the muscle). This is 6 inches down from the center top of your shoulder. Use this for the Front Height (torso) of a catsuit. Place the measuring tape in the center of your crotch between the legs, measure diagonally to the top of the center of the shoulder. Measure in inches around your hand across your palm. You should use your dominant hand, the right if you are right handed, and the left if you are left handed.